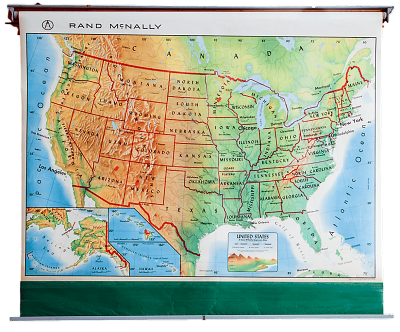 When I was in grade school—admittedly, much longer ago than I like to think—we had a big map of the United States on a roll, like a window shade, that could be pulled down whenever the teacher thought it appropriate to do so. In fifth grade, we studied United States' history and geography; so there was no World map, though there was a globe in the back of the classroom, generally hidden behind odds and ends because it was so seldom used. As a science-fiction fan—yes, even at that age—I was fascinated by the globe simply because it was, in those pre-John Glenn times, the closest thing we had to looking at the Earth as a planet. And, of course, I knew generally where Europe and Africa and Asia were—even Australia, which fascinated me because it seemed so lonesome, stuck 'way off in the South Pacific like that. But if you'd asked me to locate Belgium or Vietnam or British Honduras, well, I just couldn't have done it. I could find every one of the United States, and quickly; but for me, then, everything north of the US was Canada and everything south of it was Mexico. Essentially, the world ended at the edges of the United States map. What was true for geography was also true for history, which had begun with Columbus' "discovery" of America. Well, I was in a Catholic school; so there was a vague understanding that, at the beginning of the world, there had first been Adam and Eve and sometime after that, Rome and Jesus (who hadn't gotten along well). But then there was Columbus, with an origin point of Spain, and the world suddenly blossomed into the United States and things really started happening. Yes sir, Americans invented everything worth inventing, and everyone else in the world wanted to be just like us. Hmm, sounds a little arrogant, now. But at the time, I was simply reflecting the attitudes of my parents and teachers, TV programs and movies and everyone I knew. 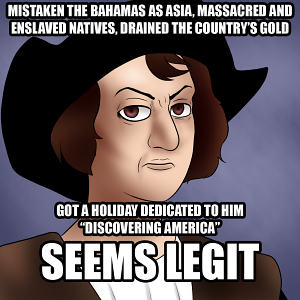 That arrogance, ironically enough, had been imported to America by Christopher Columbus himself, who had stumbled on an already-ancient land (notwithstanding its "New World" moniker) with an apparent genetic predisposition to perceive the peaceful and productive peoples he met as "savages" who needed to be "converted" into his religion and slavery "for their own good." Since we are all, culturally, the descendents of Columbus, we shouldn't be too surprised, then, that his arrogance was passed down to us. To correct another misconception, the people who preceded Columbus to America were not savages barely scrabbling out a living by hunting and gathering. The hunters and gatherers knew exactly what they were doing and were very good at it; but many other people were sophisticates who lived in spectacular cities, while others populated a great many towns and villages, just as we do. To be sure, their culture was quite different from ours—after all, they'd developed independently for anywhere between 9,000 and 20,000 years (depending on which yardstick you use). Given a few more years, and it's quite possible that an American might have "discovered" Europe. Because the Spanish Conquistadores did their best to wipe out all vestiges of the culture they found in the Americas, including destroying every example they could find of Incan and Mayan writing, it's not easy to reconstruct the political and historical context of pre-Columbian America. In fact, and with an appreciation for the irony of it, one of the main sources we have is Columbus, himself, who did make an attempt to catalog what he found, however culturally jingoistic his observations might be. Columbus made four voyages to the "New World". In none of them did he land anywhere in what is, now, the United States; on only his third voyage did he set foot on the actual continent. His final voyage was a disaster that left him and his men stranded on an island for a year, before help arrived from a Spanish colony on a neighboring island. Nevertheless, he kept copious notes of his journeys, many of which survive, either directly or in paraphrase by his brother or son. In addition, a 16th century priest named Bartolomé de Las Casas published an edited version of Columbus' journal; and his Historia de las Indias serves as an invaluable description of what was here when Columbus arrived. At the time of Columbus' first voyage, there were only legends as to what existed to the West of the Canary islands. In point of fact, there is just one island group in the mid-North Atlantic (the Azores), which may have given rise to the mythic "Antilles Islands" which, in the 15th century, had no specific location and were used as a term, the way we use "Mars" to describe any place that was impossibly remote: "You've packed all those trunks? Where do you think you're going, the Antilles?" So, when Columbus, on his first voyage, came upon the islands we now call the Bahamas, he called them the Antilles and the name stuck. Currently the Antilles are considered to be the islands of the West Indies (another misnomer, since Columbus thought he had reached India). The Antilles are divided into two major groups: the "Greater Antilles" to the north including the larger islands of Cuba, Jamaica, Hispaniola (Haiti and the Dominican Republic), and Puerto Rico; and the smaller "Lesser Antilles" on the southeast, comprising the northerly Leeward Islands, the southeasterly Windward Islands, and the Leeward Antilles just north of Venezuela. The Bahamas themselves, though part of the West Indies, are for some reason generally not included among the Antillean islands. Since Columbus thought he was in India, he of course referred to the inhabitants of these islands as "Indians" and the name has stuck, in spite of causing constant confusion for Europeans as well as irritation for Natives. But the people didn't call themselves that, of course. Columbus reports that they called themselves the Taíno, which in their own language basically meant, "The Good Guys," by which they distinguished themselves from the minority residents with whom they shared the islands, the Carib. On later journeys, Spaniards who explored South America named the locals they found Arawaks, after those peoples' name for the flour they cooked with. (Imagine an alien species "discovering" America and referring to its inhabitants as the "Hamburger Helpers.") Cultural anthropologists now believe the Arawaks and the Taíno were essentially members of one, widespread and diverse, culture. The were five Taíno kingdoms on Hispaniola alone, each with a king (cacique in the Taíno tongue) who collected taxes from his people. (Most references today define cacique as "chieftain" and describe the taxes as "tribute", part of the ongoing effort to trivialize the lives and culture of the pre-Columbian Native Americans.) 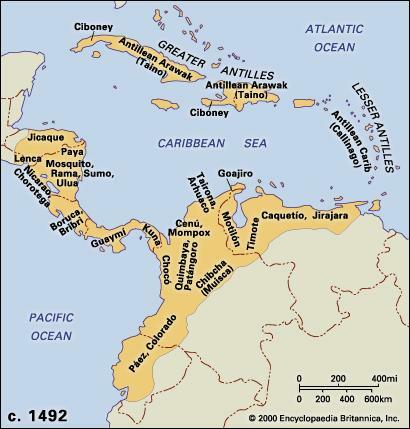 A number of towns on Hispaniola boasted populations of over 3,000 people, about the equivalent of most towns in Europe at the time. The inhabitants of the Bahamas were also related to the Taíno, but were part of a later wave of Arawak seafarers that arrived in the Caribbean perhaps centuries after the original Taíno. They are therefore now called the Neo-Taíno; and their right to a distinct classification is the source of much current controversy as white anthropologists clash with Native descendents struggling to maintain (or rediscover) a cultural identity. Those who deny the Neo-Taíno as a distinct group, simply refer to the former inhabitants of Jamaica, Cuba and the Bahamas as "Western Taíno." While the Arawak of South America seemed content to live in a society composed of easy-going towns and villages, where trade was as much a way of maintaining friendship as anything else, on the West coast of South America was the more ambitious Incan Empire, which was easily the equal of any number of European "empires" that had come and gone. They called their empire Tahuantinsuyo, which means "The Four United States," thus anticipating the great future neighbor to the north. The borders of the four states intersected at Cusco, which was the capital of Tahuantinsuyo and remains an important city, today. The Incans built cities that were magnificent by any standard; they built roads. Although it is generally considered they did not have writing, new research indicates that their "writing" may have been a binary code that stored information as a complex series of knots. Although they occasionally made use of conquest to expand their territory, they mostly used goodwill and the obvious benefits of the protection and trade made possible by a powerful and benign government to attract more peoples into the fold. Although the empire included speakers of over 700 local languages, it encouraged a universal language, Quechan, which is still spoken by a number of their descendents today. When the conquistadors encountered the Incans, they thought the Incans had never invented the wheel, because they had no carts or wagons. When the Spaniards encouraged the Incans to use the wagons they had brought, the reply was, "Why should we put a man out of a job?" 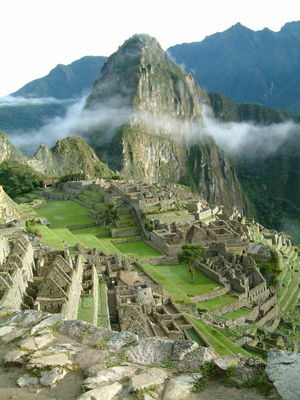 —Because a respectable Incan employment opportunity was that of porter. In point of fact, and despite the good roads, wagons didn't make much sense in the steep Andes, where an animal hitched to a wagon could never rest because there were virtually no flat places to stop. A wagon would always want to roll downhill. Besides, no suitable draft animals had evolved in South America. Archaeologists have found Incan toys with wheels; so we know the Incans had not failed to "invent the wheel." They merely had the good sense, in their environment, not to use it. The Incan Empire ended with the Spanish execution of the last Incan emperor, Atahualpa. The Incans, peaceful people that they were, were utterly unprepared for the vicious Spanish conquistadors, with their arrogance and determination to enslave and convert all non-Christian peoples. In Central America, the Mayan Empire was in decline, though still very much alive. However, the days of the building of its most magnificent cities were hundreds of years past. The Mayans, unlike the gentler Incans, were as vicious as the Spanish, who were lucky to not have encountered them at their prime. 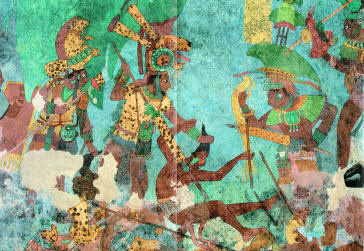 The picture below illustrates a conquest of the Mayan king, which would reap him many slaves and human sacrifices. Other surviving paintings show men and women engaged in sacred bloodletting rituals. The cenote at Chichen Itza was famously found to be filled with the bejeweled skeletons of human sacrifices, including those of children. Between 800 and 900 CE, the Mayan civilization began a decline, according to archaeologists, who note that no new buildings were constructed then (even repairs were seldom done) and no new monuments or monumental inscriptions have been found from that period. The use of the word "decline," of course, implies that building is the height of purpose of a culture. And the reason for this "decline" is unknown, simply because no records survive of it. Causes ranging from the collapse of key trade routes to the spread of a deadly epidemic have been advanced to explain it. But, personally, I think what happened was that the people revolted against their bloodthirsty leaders. I have no evidence, except that when the Spanish arrived, the Maya they found were peaceful people who were more interested in art, literature and science than in human sacrifice. In addition, the Maya of the 1500s had no central authority, no king or pope. So they managed to hold off Spanish conquest for years, as each Mayan state had to be conquered independently. That last ones, the Itza polity of Tayasal or Naj Peten at Lake Petén Itzá, and the Ko'woj city of Zacpeten; finally surrendered to the Spanish in 1697. Further north, in the Valley of Mexico, three tribes had combined to form the Aztecs. (There was never an Aztec tribe; the Aztecs were the combination of the triple alliance of Tenochtitlan, Texcoco, and Tlacopan.) Following in the footsteps of the Maya—indeed, cultural similarities make me suspect that the Aztec were, at the least, inspired by legends of the fierce, bloodthirsty Maya of centuries past—the Aztecs used fear and human sacrifice to induce obedience in their neighbors. Unlike those of the Maya and Inca, the Aztec writings escaped purging by the priests so we have a number of complete books of these people. They traced their origins to seven tribes from a place they called Aztlán (Atlantis? ), who left their unknown home to colonize new lands. By the time the Spanish arrived, the Aztecs had developed a nation of impressive cities and highly-developed trade, with routes extending throughout Central and North America. The Spaniards and their Tlaxcallan allies became increasingly dangerous and unwelcome guests in the capital city. In June, 1520, hostilities broke out, culminating in the massacre in the Main Temple and the death of Montezuma. The Spaniards fled the town on July 1, an episode later characterized as La Noche Triste. They and their native allies returned in the spring of 1521 to lay siege to Tenochtitlan, a battle that ended that August 13 with the destruction of the city. Today's Mexico City was built on the ruins of the Aztec capital. In North America, the northeast was ruled by the Haudenosaunee (referred to by Europeans as the Iroquois). The name meant League of Peace and Power, and was different from anything found in Europe because it was a civilization of forest dwellers, rather than city dwellers. Nevertheless, the Haudenosaunee were politically and commercially sophisticated; they were a union of five nations (later, six) whose constitution, known as the Gayanashagowa (or "Great Law of Peace") was adopted on August 31, 1142 (the European date is based on a coinciding solar eclipse). We modern Americans pride ourselves on having the world's oldest constitution in use, but the Haudenosaunee lived under theirs over twice as long as we have (so far) under ours. When the European invasion came their way, the Haudenosaunee were clever enough to distinguish one group of Europeans from another, and to take sides in the Europeans' internecine battles to their own benefit. With no cities to lose, the Haudenosaunee survive to this day (as the Iroquois Confederacy). By comparison to the forest-dwelling Haudenosaunee in the North, were the city-and-town-dwelling Mississippians in the South. Little is known of them because, although Hernando de Soto encountered them briefly, smallpox outraced the later Europeans, bringing the culture to extinction before it could be studied. And, unfortunately for us, the warm, moist climate of their lands—now the Gulf states—is not conducive to preservation. We know they constructed enormous mounds for some unknown purpose, and that their communities were built around them. The mounds are currently being studied. The fate of the Mississippians was shared by all the peoples of the New World. Since they did, in fact, have extensive and well-traveled trade routes, the new diseases from Europe introduced at their shores raced inland, causing startling and catastrophic deaths among people who had never even heard of white men. The newly-lowered populations, unable to maintain cities or even towns, misled early anthropologists into believing that the New World had always been sparsely populated, a belief that is only now, and amid great controversy, being redressed. To be sure, there were broad swaths of the two continents that were lightly populated. Desert areas, such as one finds in New Mexico, Arizona and Southern California, and in Argentina and in Chile, and very cold areas such as Alaska and Tierra del Fuego, simply cannot support the density of life that one might find where water is plentiful and the climate mild. Ironically, the isolation of tribes eking out a living in such places may have permitted them some protection from the onslaught of the new diseases, which might explain why so many tribes still retain their identities in such places as Arizona and Alaska. North and South America may not accurately be called the "New" World but they certainly comprised another world, one in which the cultures had developed in unique directions and with values very different than those in Europe and Asia. We'll never know what irreplaceable knowledge we lost when the Incan and Mayan books were burned, what spiritual insights and understandings of ecology are only now re-emerging, that the Mississippians or Plains Indians may have taken for granted. Old World progress was built on the shoulders of the neighbors; the same was true in the New World, but the shoulders were broken when the Europeans arrived. whether intentionally, through book burnings and enslavement and enforced conversion, or unintentionally through the spread of disease, an entire world, one which had progressed independently for 20,000 years, was destroyed over the space of two centuries. And the present world is much the poorer for it.